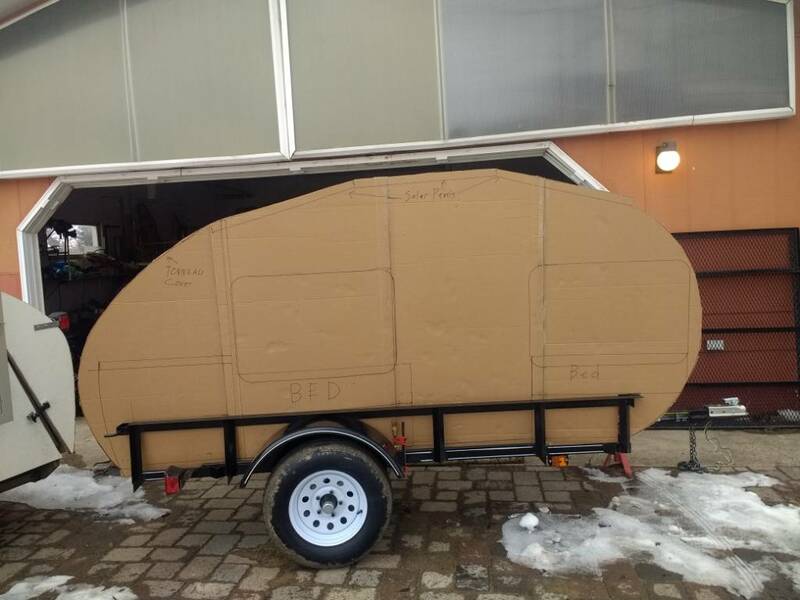 I plan on starting a new teardrop style foamy 5'x10'+ camper. 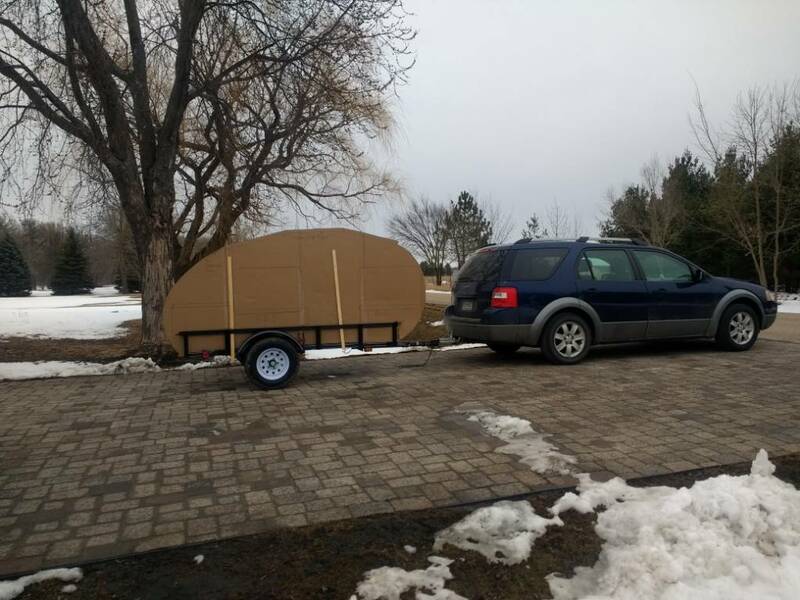 Using a TSC 5x8 mesh floor trailer with 13" tires. With cross-way beds and drop floor. The floor plan will be front to back A 30" cot with a bump out for my feet. Then a 10" deep drop floor with a commode on one end. then a second 30" cot(half a queen). Galley wall with a roll up Tonneau pickup box cover as the galley hatch. The bump outs will be big removable storage tubs. That will be put in place when parked. The roof will be 3 2'x5' solar panels One for fridge. two for CPAPS and lighting. Walls will be 1 1/2 foam with PMF and 4 1/2' tall. With a front profile like the 2+2 with the 20" rounded front for the front cot to fit mostly in. Is the Carry-on trailers any good for the price(on sale now $640)? Last edited by KennethW on Sat Jun 23, 2018 8:42 am, edited 3 times in total. 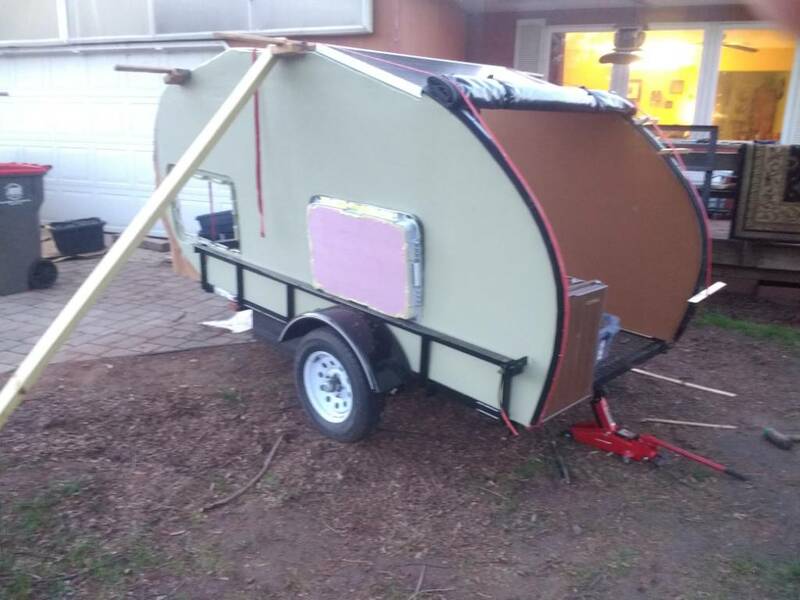 KennethW wrote: I plan on starting a new teardrop style foamy 5'x10'+ camper. 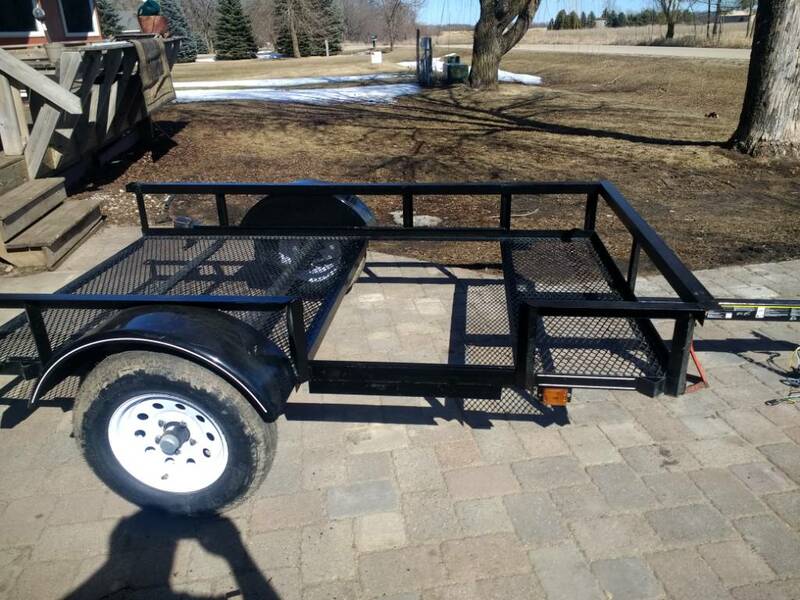 Using a TSC 5x8 mesh floor trailer with 13" tires. With cross-way beds and drop floor. The floor plan will be front to back A 30" cot with a bump out for my feet. Then a 10" deep drop floor with a commode on one end. then a second 30" cot(half a queen). Galley wall with a roll up Tonneau pickup box cover as the galley hatch. The bump outs will be big removable storage tubs. That will be put in place when parked. The roof will be 3 2'x5' solar panels One for fridge. two for CPAPS and lighting. Walls will be 1 1/2 foam with PMF and 4 1/2' tall. With a front profile like the 2+2 with the 20" rounded front for the front cot to fit mostly in. I have a carry-on trailer. 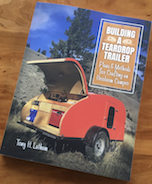 I don't think it's good for tear drops because the bottom is not perfectly flat so it took a lot of work to get it close to that and reduce the amount of flex in the trailer. I'll book you a northerntool since Harbor Freight is on recall. Here is the profile I am thinking of going with. The side rail will be cut out for the door. Three solar panels on top. A tonneau cover on the gallery. 10"drop floor. Two 30 cots. The metal bar is 6'. 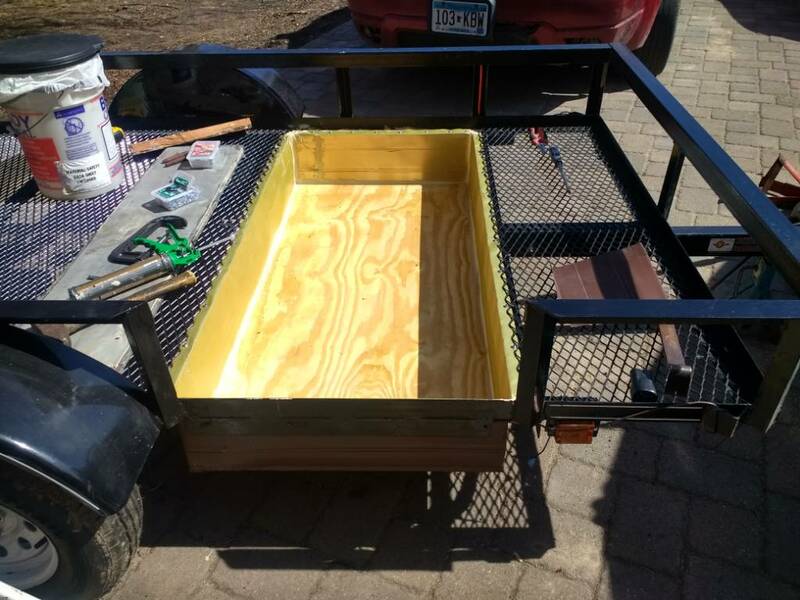 Have been modifing the trailer cut the railing for the door and moved a cross beam for the drop floor. And put in the drop floor. Does the drop floor give you full standing? No supports under the ply? Much deflection standing in the middle? John61CT wrote: Does the drop floor give you full standing? 3/4 plywood does not need support to bridge 28" with the ends supported too. Did not feel any deflection with 500# walking in it. 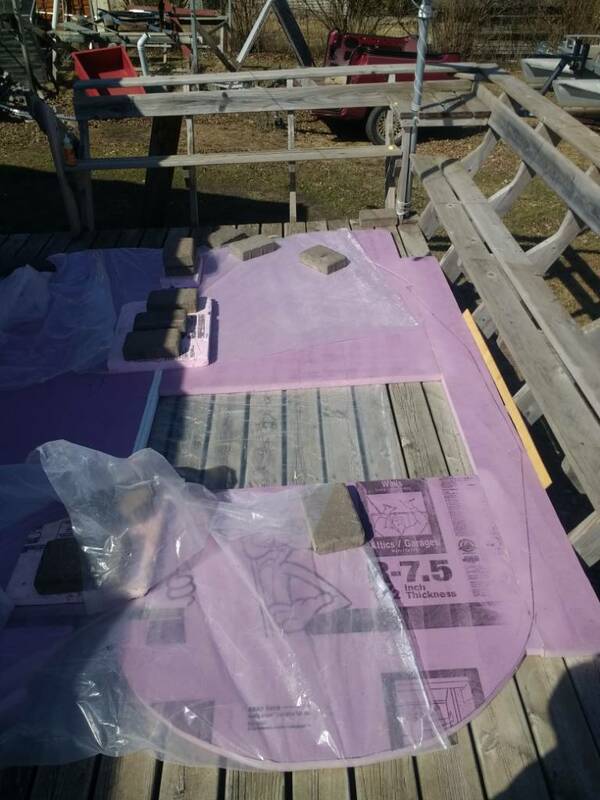 The floor is held up by the aluminum(flatten rain gutter) walls rapped around the top and the bottom of the floor. I ordered a pair of P155/80R13 tires to replace the hard riding 175/80-13 trailer tires. 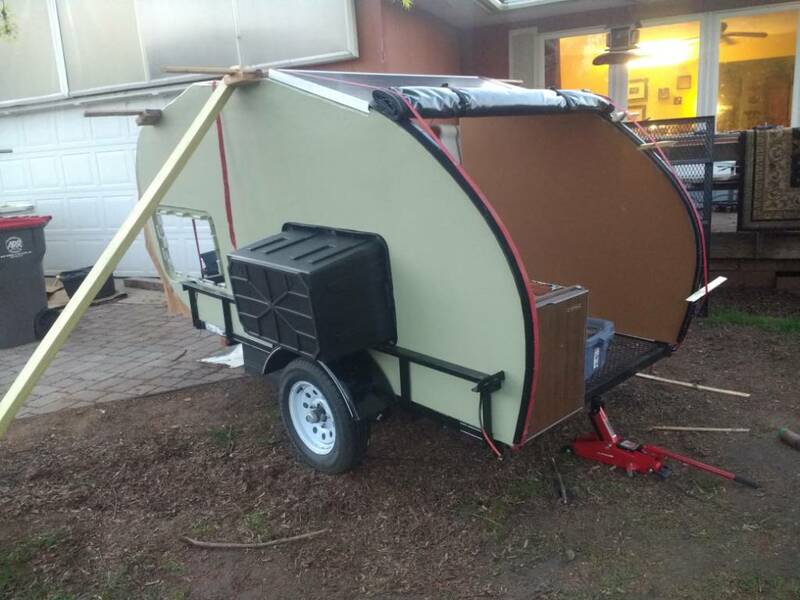 I also ordered a Maxxair 00A04401K with a smoke top to be mounted on the upper wall as the roof is all solar panels (450 watts) I got the Maxxair because of the two lift arms to lock it down tight. As it is on the wall. Is the smoke lid on a Maxxair really dark or more of a heavy tint? A sweet fact is gorilla glue does not stick to vapor bearer plastic. Works great when gluing up the sides. Last edited by KennethW on Tue May 01, 2018 11:56 am, edited 1 time in total. Looking good! Keep it up! Most people go up in size for tires and wheels, interesting that you opted for smaller tires. Great looking! 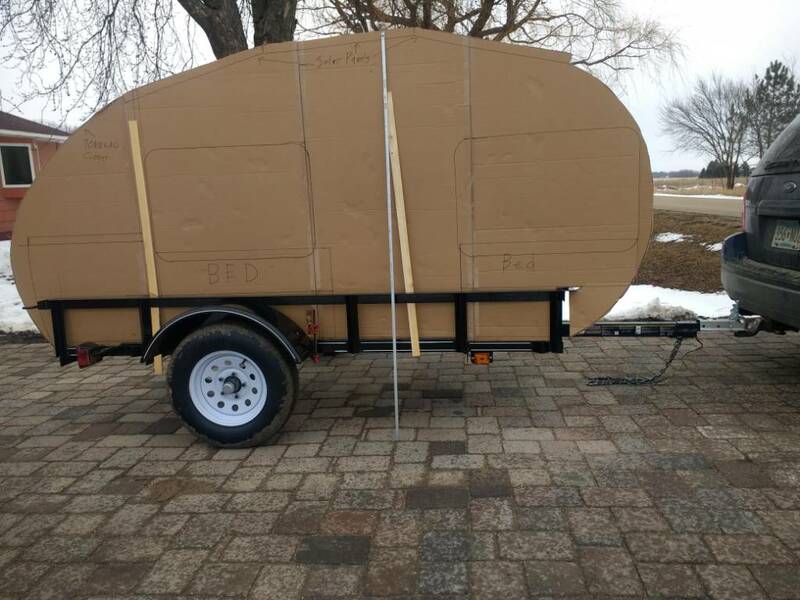 Some pics make the trailer tongue look too short. How is it when turning? clamlamp wrote: Looking good! Keep it up! Most people go up in size for tires and wheels, interesting that you opted for smaller tires. All the bigger 13" tires are trailer tires. I wanted the soft ride of a car tire Plus the smaller tires are only $30 each. I may have to extend the tongue(or get a extended hitch). It is bolt on. Easy to fix if needed. Getting the canvas on the walls. May not paint the insides of the walls .I like feel and the brown color. KennethW wrote: Getting the canvas on the walls. May not paint the insides of the walls .I like feel and the brown color. What a view for your workshop! Just a little update. 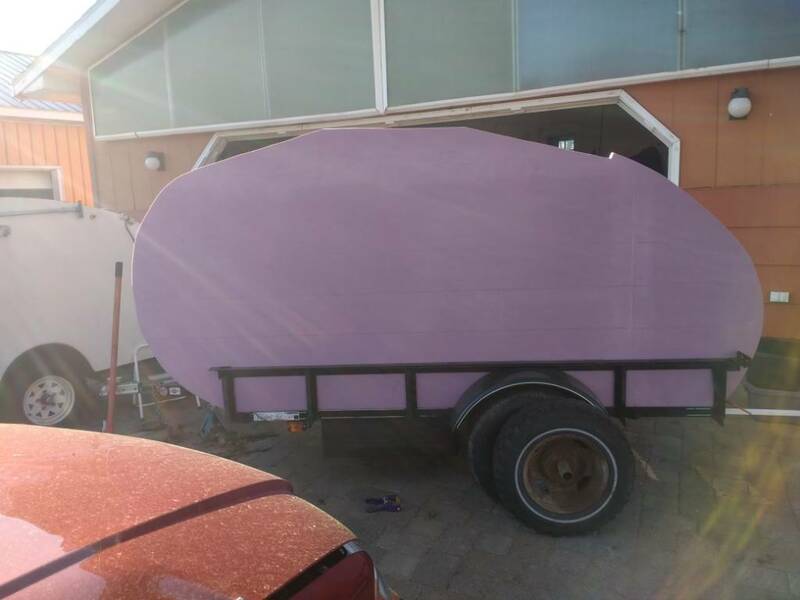 Putting the sides on the trailer. Gluing down one of the three roof-solar panels and the tonniau cover gallery hatch. Have to finish the foot bump-out cover and paint the foot bump-out tub. 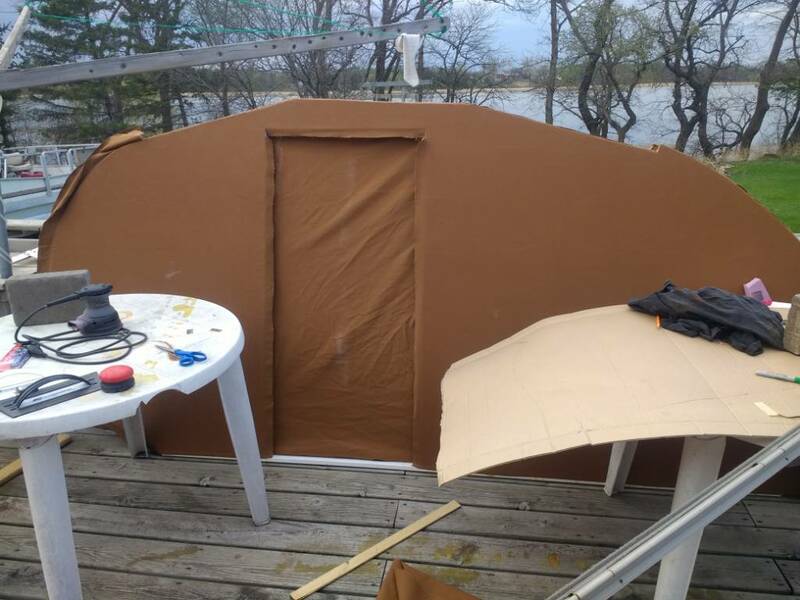 How are you glueing the panels to the walls? Canvas is glued to 1 1/2 foam with titebond II. 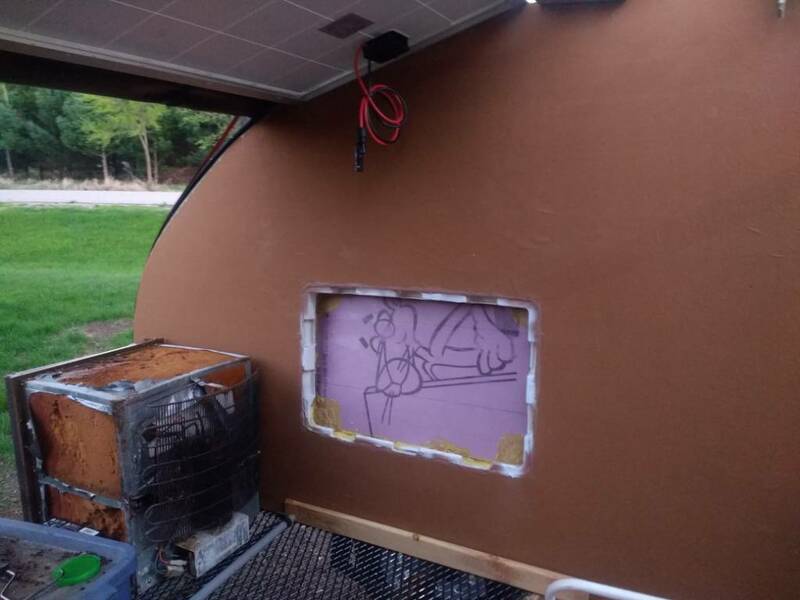 The walls will be bolted (samwiched) between the side walls to the trailer side rails with the bed frames on the inside.